Sometimes, Weird errors appear while browsing in Google Chrome. This article is about how to fix ERR_SPDY_PROTOCOL_ERROR. The error which has been featured in this article is an SSL error. It means Users encounter this problem on Google chrome while visiting https websites. There are numerous reasons for this type of problems. But, The good thing is you always can solve err_spdy_protocol_error anytime. There are some common things that can cause this problem. The Firewall of your antivirus program, third-party security programs, browser extensions, misconfigurations etc. are most known reasons. But, There might be other things. By the way, You can take some effective steps to solve this problem. To get rid of this error on chrome, you can follow the following methods. It is the most common and effective solution to solve the error you have been encountering. Anyway, To flush the SPDY sockets in chrome, follow these steps. Now, Type chrome://net-internals/#sockets in the address bar and hit enter. Then, Click on the “Flush Socket Pools” button. After that, Restart the Chrome. It should fix err_spdy_protocol_ error. If it doesn’t help, follow the next methods. Is there is a pending update? Users often encounter problems on outdated chrome versions. So, You should update it regularly to avoid potential security risks and errors. If you don’t know how to update chrome, here is the instruction. In chrome address bar, type chrome://settings/help and hit enter. It should automatically check for the update. If it finds any, it will download and install it automatically. After that, Just relunch the chrome. Now, You should not encounter the ERR_SPDY_PROTOCOL_ERROR again. Still getting the error? You have this method as an awesome solution. According to many users, it worked for them. So, If you are lucky, it may fix ERR_SPDY_PROTOCOL_ERROR for you. To flush DNS and release IP, follow these steps. 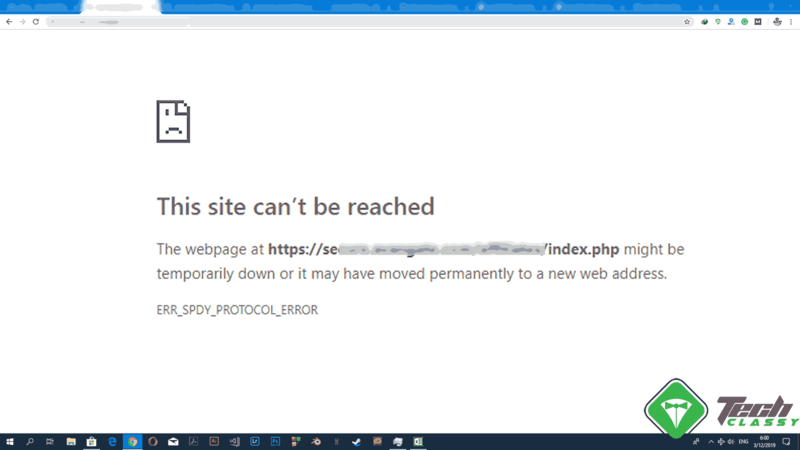 After that, Try to browse the websites where you had encountered the SPDY Protocol error. I hope you won’t face it again. You may have been using Bitdefender, Kaspersky, Trend Micro, Mcafee or any other antivirus programs for a long. These also may cause this type of problem. To be sure about it, you should disable the antivirus and see if you still encounter the problem or not. Some antivirus may not let you disable. In this case, Perform clean boot. By the way, You can tweak a few things in your antivirus to get rid of ERR_SPDY_PROTOCOL_ERROR. At first, Disable SSL scan feature from your antivirus. Also, Disable the network scan feature to see if it helps. I hope, Any of the first 4 methods will “solve err_spdy_protocol_error” on Google Chrome. If not, you can follow this one as the last and final method. Resetting google chrome will clear all of its browsing data, correct its settings to default. As a result, It has a good chance to fix all of its errors. If you don’t know how to do it, follow these steps. At first, Type chrome://settings/ in the address bar. Now, Scroll down and click on Advanced. These are the most working ways to fix ERR_SPDY_PROTOCOL_ERROR. I hope these tips will help you when you encounter this problem. If you know any other method, let us know in the comment box.